Be the first to share your favorite memory, photo or story of Mabel . This memorial page is dedicated for family, friends and future generations to celebrate the life of their loved one. 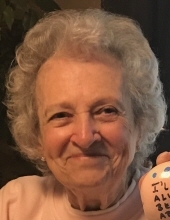 Mabel Isabella Pollack, age 88 of Macomb, peacefully passed away at home on January 28, 2019 surrounded by her loving family. Mabel was born on August 21, 1930 to Albert and Alice Smart, whom she loved dearly, in Detroit, Michigan. She attended Stellwagon Elementary School and graduated from Denby High School. She married her long-time sweetheart, Thomas, on August 10, 1957 and together they raised three wonderful children; Timothy, Karen and Anne. Beloved mother of Karen and Anne; proud Mame of Alexander, Adam, Amanda, and Jack. Preceded in death by her loving husband, Thomas; dearest son Timothy; and her beloved parents Albert and Alice Smart. She will be missed by many friends, nieces, nephews and extended family. Mabel's loving and kind nature will be forever missed. Visitation on Thursday, January 31, 2019 from 2-9PM at Lee-Ellena Funeral Home. Rosary at 7PM. Funeral Service on February 1, 2019 at the funeral home. Instate, or gathering time, 10 AM. Service at 11AM. Procession to Resurrection Cemetery to follow. To send flowers or a remembrance gift to the family of Mabel Isabella Pollack, please visit our Tribute Store. Instate, or gathering time, 10AM. Procession to Resurrection Cemetery to follow. "Email Address" would like to share the life celebration of Mabel Isabella Pollack. Click on the "link" to go to share a favorite memory or leave a condolence message for the family.